Hos Dorte: Midway reminder for HM&FMC- and a Blog Hop! Gruffies image for your creation, just add some twine to it. 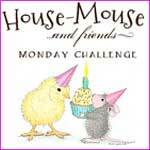 please visit the House Mouse & Friends Monday Challlenge. I have used 'My Hat's Onto You' for today's card. big, so you don't have to use a lot of embellishments. who celebrated his 16th birthday a week ago. Can't believe how time flies! The crazy paper is from Basic Grey. and a sentiment -voilà- the card is ready! Joanna Sheen Challenge- Button it up! and good luck with the amazing sponsored prizes ++ the team candy prizes up for grabs. 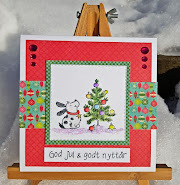 Gorgeous, festive card Dorte....tomorrow I will finish my card and then I'll join the bloghop! o what a cheerful card Dorte with lotts of colours. Hi Dot, I lost your - now I found you again!!! Your Basic Grey papers are stunning - I can't remember which they are - Lime Rickey I think!!! Your image is just adorable - fabulous colouring!!! Thanks for joining in With creative inspirations anything goes challenge. Lovely card! Thanks for sharing it with us over at Creative Knockouts! So funky colorful! Thank you for joining us at Seize The Birthday! Such a cute image Dot. The DSP is a fabulous background. A lovely back to the card too. Adorable house-Mouse card. fab use of twine (my fav way to use it). GORGEOUS in color and designer papers. Love the hat embellishment too!